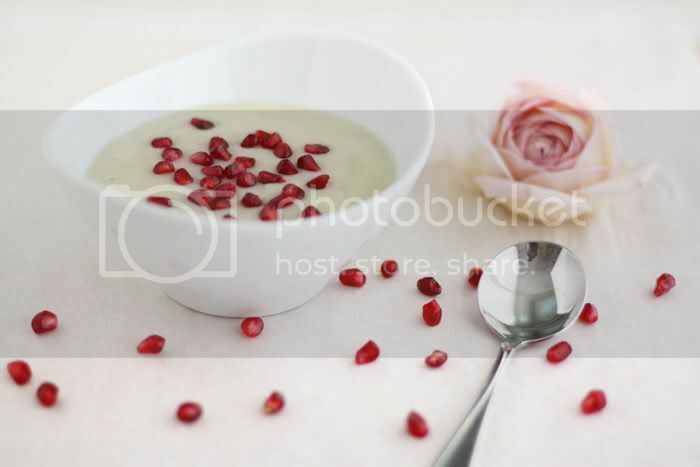 A light, creamy sunchoke soup, dressed up with a vibrant pomegranate reduction. The first time I tasted Jerusalem artichoke (or sunchoke) was when making dolma, and it was love at first try. I’ve been waiting for this beautiful root to come back in season in order to try this dish. The soup is wonderfully smooth, mild, and comforting, with subtle aromas of rosemary and mate. 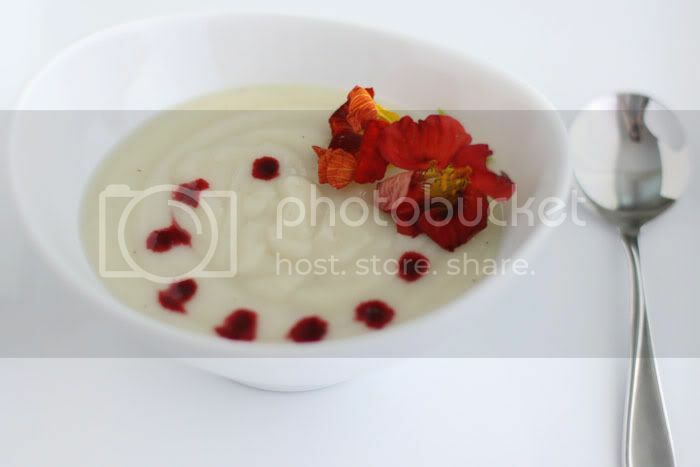 The fresh pomegranate reduction brings a very bright note of sweetness to the calm and earthy flavours of the soup. Yerba mate was used to infuse this soup, as one of the most celebrated flavours of Argentina. I’ve always loved the energizing taste of mate tea, together with the fact that it contains no regular caffeine. 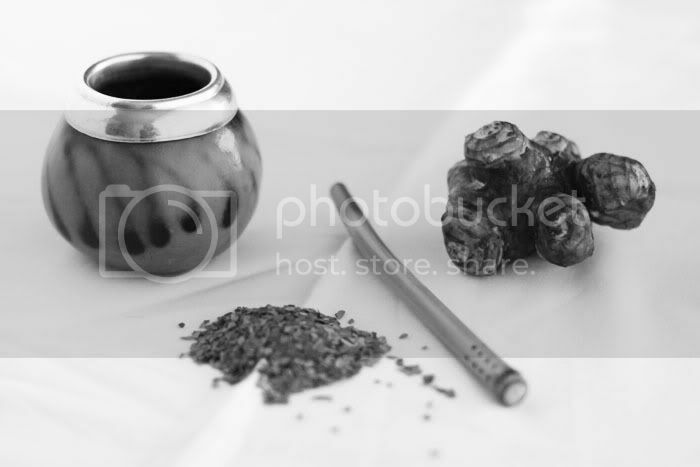 It is customary to drink Yerba mate from a gourd (dry squash shell), through the bombilla (tea sipper). The gourd must be cured first, in order to seal all the pores and remove any vegetable flesh still present. To do that, one must brew mate in the gourd for 24 hours, empty it, and scrape the inside walls, repeating the process once more. The water for brewing mate should be around 180F, never boiling. The cebador (host) usually takes the first gourd full, after which more water is added and the gourd is passed to the guests. Scrape the sunchokes with a sharp knife to remove the brown skin. (I’ve tried a variety of techniques, such as blanching the roots in order to make the process of removing the skin easier, but scraping is the only one that worked for me.) If you’re not particular about the colour of your soup, I’ve read that it is not necessary to peel them completely, or at all. Make sure to put the peeled sunchokes into a bowl of cold water with some lemon juice, to prevent discoloration. Chop the sunchokes into one-inch sized pieces. Gently heat olive oil in a medium sized pot, add sunchokes, leek and garlic, and saute for a couple of minutes. Add lemon juice, rosemary sprigs, salt, pepper, and about two thirds of Yerba mate. Bring to a boil, turn the heat down, and let simmer for about 30 minutes. Remove rosemary sprigs (if the colour of the soup is important). In a blender, blend the soup until smooth. If the soup appears too thick, add more of the mate and bring to a gentle boil, then remove from heat. Adjust salt and pepper. Serve with pomegranate reduction. Score the skin of a pomegranate to make 8 parts. Fill a large bowl with water, and break the fruit into 8 pieces, holding it under water (that way you won’t get pom juice all over yourself). Separate the kernels from the skin and white parts under water. The kernels should fall on the bottom of the bowl, while the rest will rise on the surface. Discard the skin and white parts, and drain the kernels using a colander. In a high speed blender, carefully pulse the kernels, releasing the flesh and juice, but not breaking down the seeds. Strain through a fine strainer and discard the seeds. Pour the juice into a shallow dish and place it in the dehydrator at 115F for several hours, until the liquid is reduced to a thicker consistency. Store in a covered container in the refrigerator. The reduction can also be done the conventional way, using the stove. Such a gorgeous soup! I’m a huge fan of jerusalem artichokes (sunchokes) and the pomegranate reduction sounds like the perfect paring! Beautiful! How do I get an invite? This looks amazing! Your blog has to be one of the most visually stunning food blogs around. I am in love with it. Your bread post a few months ago was divine! Gorgeous and I can’t wait to try the soup. very good ! maravillous ! The pix are really wonderful and the soup is so original! Love the idea of paring your event themes with the food. How do we get invited to these amazing parties? You guys rock, and always have the most interesting posts. So so gorgeous!Can’t wait to see other creations for your tango menu. How creative! Just found your blog and am completely crazy in love with it. Your photos are stunning, and your food is so creative. I will be visiting very often!!! This is just too beautiful for words…styling, ideas, colors and flavors. I can’t believe how talented and creative you ladies are. any idea what kind of healthy cake to do for my baby’s first birthday? you are my inspiration and i’m sure you’ll help!! thanks! Bitt, we are still working all that out. Right now we only have local guests, but planning and hoping to expand very soon. Mamacino, that’s so sweet, thank you! Miki, so sorry for the late response! It all depends on how healthy is healthy :) And also. how young is the baby? Everyone seems to like this chocolate ganache, and it is very easy to make. Any raw cheesecake is nice as well, like this one, for example.